Last week an MTA bus driver crushed a pedestrian to death in Mott Haven. By all accounts the victim, walking with a cane, was in the crosswalk at Willis Avenue and E. 147th Street when the driver ran him over while turning left. If reports are correct the bus driver should be subject to charges under Section 19-190, the new city law that makes it a misdemeanor for drivers to hurt or kill pedestrians who have the right of way. Yet before police cleared the crash scene, NYPD exculpated the driver in the press. It’s possible police may eventually file charges for the Bronx crash — the one time NYPD is reported to have applied Section 19-190 so far, in the case of the cab driver who killed Silvia Gallo on the Upper East Side, charges didn’t come until weeks later. But 10 months into Mayor de Blasio’s Vision Zero initiative it’s still standard operating procedure for NYPD to declare “no criminality suspected” before investigators have taken down the barricade tape. NYPD also continues to blame victims for their own deaths. On Monday at around 7:19 p.m., the driver of a Ford SUV fatally struck pedestrian Cristina Alonso in Dyker Heights. Other than the basics like the victim’s name, the driver’s age and vehicle make, and the time and location of the crash, the only information released by police was that Alonso was not in the crosswalk. How did the driver fail to see Alonso? Was the driver speeding or using a cell phone? A motorist’s actions before a serious crash are at least as important as those of the victim, but they don’t fit the standard NYPD crash narrative and are virtually never revealed to the media. According to NYPD, if you die while jaywalking or committing some other minor infraction, it’s your fault. If you are killed by a motorist while following the law, your death was an unpreventable tragedy. Section 19-190 was intended to make the latter scenario a thing of the past. The public can only hope NYPD has reformed the way it conducts crash investigations, even if the department hasn’t dropped its habit of assigning blame to victims in the press. I wholeheartedly admire anyone involved in the negotiating and implementing of change with city officials, etc. The fact that this continues to occur and that the NYPD behaves so atrociously makes me crazy; I full well know they do solid work in some areas (..right?) but scenarios like this make me jump right to “remind me why they exist again..? How we can take them seriously? Who pays their salaries?” Sometimes I need to step away from the Vision Zero news and horror stories, because the blood boils and I lose sight of the long game — in my mind, it shouldn’t ever take this long to get the NYPD to do their jobs properly and with integrity, and yet the battle will continue far longer. “Remind me why they exist again” … my sentiments precisely. If NYPD can’t do traffic enforcement, there’s no point in paying them to do so. And make no mistake, police personnel cost a bundle, with their gold-plated benefits and full pension after 20 years. It’s worse than that. Kelly never pretended to care so advocates never pretended to expect anything from him. Kelly dismissed pedestrian safety altogether, saying that accidents were bound to happen in a big city. Instead he cracked down on jaywalking and issued thousands of tickets to cyclists for a couple of weeks. So Bratton’s betrayal of that promise, and de Blasio’s failure to get his commissioner in line with his administration’s agenda is far worse than Kelly’s indifference. It’s cynical on Bratton’s end – just a ploy to be appointed? – and cowardly on de Blasio’s. More cops are being paid to direct auto traffic (talk about a job at risk of being replaced by automation….. when was the traffic light invented again?) than are writing any kind of tickets or enforcing laws that create danger in the transportation system. 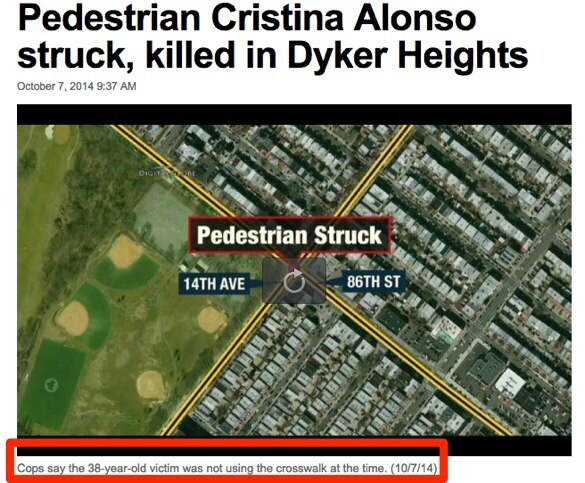 Its become obvious that the NYPD is not a participant in Vision Zero. What the DOT manages to accomplish in the next 7 years with De Blasio looking completely the other way could definitely hit some low hanging fruit in the road safety area though. Too bad there’s not much in it for cycling. While it is easy to blame the cops for not arresting the drivers, I do believe that there reason there are no arrests in these cases is because society as a whole disapproves of arresting drivers for “accidents” because citizens recognize that it could be them arrested should THEY be in an “accident”. Maybe I am naive, but short of a few callous drivers, most drivers probably cause accidents due to ignorance and carelessness, and a false sense of their driving abilities. However, if the consequence of hurting pedestrians and cyclists regardless of the cause or whose “fault” it is, is at a minimum, loosing one’s license, say, for 5 years,and automobile impoundment, it might result in all drivers being much more careful, while removing dangerous drivers of the streets immediately. An immediate and certain consequence for dangerous driving without a drawn out legal process might be helpful? I agree to some extent about cultural perspective. But it’s especially bad in NYC due to weak NY State laws and a greater lack of willingness to charge and prosecute than many other places in the US. And of course that’s completely counter intuitive given New York’s low car ownership rate. Yes, there is cultural push back, but the NYPD is nowhere near approaching that point. No one is going to fault the cops for, at the bear minimum, charging drivers with failure to yield after running over a person in a crosswalk. They’re not even doing that much. And there is already a law on the books in NYC that automatically assumes fault if a cyclist is riding on the sidewalk and hits and injures someone. Yet there is NO such equivalent law for cars. That’s just flat out insane. I believe all this has more to do with our politicians and police officers largely having a widely disproportionate windshield perspective, counter to the bulk of the population. I live down the block from where this tragic accident took place. I didn’t see it but heard the impact and screams and rushed downstairs to witness the horror of this lovely young woman dying right in front of me. A friend of mine who saw the accident happen said that Cristina Alonso tried to cross 14th Avenue against oncoming traffic and a red light and that she can’t possibly put the blame on the motorist who wasn’t driving fast at all. I promise to honor Cristina’s memory by promising to never again try to cross a street against a red light. Germane, knowable facts (driver speed and position of brake pedal, knowable via black box) are not reported and I daresay are likely not captured as evidence. A germane, known fact – whether or not the Collision Investigation Squad was called to the scene as required by law, were also not leaked to the press. Where the victim was at time of impact is likely based on dubious information. Where’s the source? The exculpating declaration cites no video recording of victim position, witness testimony nor the police officer name/badge number of the person declaring “no criminality”. It’s completely stateless. Moreover, we know that when a car hits someone hard enough to kill them, the person is often thrown through the air or dragged some distance from the point of impact. Can a responding officer really know with any degree of certainty where the victim was at time of impact?